Birds of prey have excellent eyesight. Scientists estimate that they can see two to eight times better than humans. With good eyesight often come big eyes. And, indeed, raptors’ eyes are very large compared to the size of their heads. If our eyes were the same size as a raptor’s in proportion to our skulls, we would have eyes as big as oranges! Think of the expressions “watching like a hawk” or “eagle eyes.” They refer to the amazing eyesight of all birds of prey, not just eagles and hawks. Since most raptors are hunters, they must be able to see their prey, sometimes from great distances, and calculate just the right moment to strike. In fact, scientists have shown that some raptors can spot medium-sized prey from at least 1 mile (1.6 km) away. That would be like spotting a rabbit across more than 17 football fields lined up in a row! If that weren’t impressive enough, birds of prey must be able to maintain focus on their prey while in fast pursuit and as they close in. Raptors also use their eyesight to identify other members of their species and to avoid predators. Raptor eyes face forward, to help determine distance. To help them do all of these amazing things, raptors’ eyes have many interesting adaptations. First, the birds have what is called binocular vision. Like many other animals that hunt for food, including humans, a raptor’s eyes face forward, which creates some overlap between what the right eye and left eye see. This helps them determine how far or close an object is. Compare a raptor’s eyes with those of a prey animal, such as a deer. Notice that the deer’s eyes are much farther apart, almost on the sides of its head. This eye placement works well for deer to see predators that try to sneak up on them. On the other hand, forward facing eyes are important for an animal that makes its living chasing moving prey. If you watch a bird of prey long enough, you will probably see it bob its head from side to side, move its head around in circles, or even turn its head almost completely upside down. This isn’t some kind of strange dance. Raptors do this to triangulate an object and better determine how far away it is. Most birds are able to see ultraviolet (UV) light, which is invisible to humans. This may be beneficial for many reasons, including allowing them to see urine trails left by some prey animals such as mice and voles. Some rodents produce urine and feces containing elements that reflect UV light. Their urine trails are like neon signs that lead the raptors right to them. Diurnal raptors, which are active during the day, have good color vision. Owls, which are mostly nocturnal or active at night, have less ability to see in color, but they do have the amazing ability to see in very low light conditions. They probably can’t see too well in pitch blackness, even the tiniest amount of light from the moon or other source enables them to see and catch their prey. As you can see (no pun intended), a raptor’s eyes are very important to its survival. Accordingly, they have several features that help protect these valuable organs. 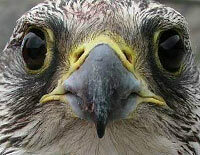 To start with, raptors’ eyes are surrounded by bone, which helps protect the eye and hold it in place within the skull. Because of this, birds of prey can’t move their eyes in their heads like we can. To look left or right or up or down, the bird must move its entire head. To compensate, birds of prey are equipped with flexible necks and are able to turn their heads a lot more than we can. Contrary to popular belief, an owl cannot turn its head 360 degrees from a forward facing position. However, it can turn its head at least 180 degrees, maybe up to 270 degrees, from a forward-facing position. Not too shabby! Harpy Eagle with nictitating membrane closed. 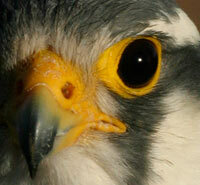 For additional protection, raptor eyes are equipped with not one, not two, but three eyelids. Two of their eyelids are just like ours; they move up and down to close their eyes. The third eyelid is known as a nictitating membrane, and this is the eyelid they use to blink with. It is a thin, semi-transparent lid, which moves from side to side. Closing and opening it helps keep their eyes moist and clean. When closed, it also helps to protect the bird’s eyes but still allows some vision. Birds of prey might close their nictitating membrane when feeding their chicks, when making contact with their prey, when in a fast dive, or even during a heavy rainstorm. An osprey closes its nictitating membrane when diving into water after fish – just like we might put on a pair of water goggles before plunging in to a pool. 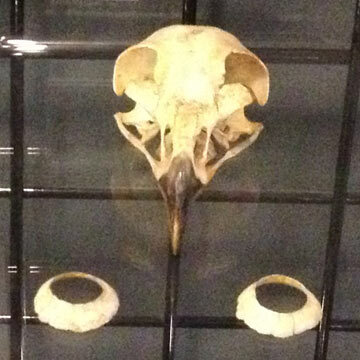 Finally, birds of prey have a bony ridge above the eye. Feel above your eye, where the eyebrow grows. Humans also have a bony ridge there. 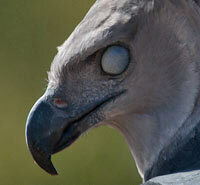 In raptors, this helps to protect their eyes from protruding branches or other foreign objects. This can be very helpful, for example, when hunting in areas of thick vegetation where a stray twig or leaf could accidentally poke a raptor in the eye. This bony ridge also acts like a built-in baseball cap, since it helps shade their eyes from the sun! Some people think that birds of prey look angry or menacing because of this “rigid brow,” but in reality it is just one of the many useful features a bird of prey has to help it remain healthy. The more we learn about animal behavior and adaptations, the better we understand that even though an animal may look or act strange or silly to us, chances are it looks and behaves in exactly the ways it needs to in order to survive. 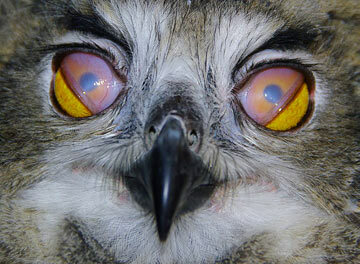 The nictitating membrane is a thin, semi-transparent lid, which moves from side to side. Closing and opening it helps keep their eyes moist and clean. Raptors’ eyes are surrounded by bone called a sclerotic ring, which helps protect the eye and hold it in place within the skull.